Yes everyone, it’s the time of year again to say goodbye to loved/hated cards we played in standard for the past 2 years. In case you are a new player or out of the loop when it comes to standard: when Guilds of Ravnica is released, the 4 oldest sets we had in standard will rotate out: Kaladesh, aether revolt, Amonkhet and Hour of devastation. For more information on what’s in standard check out this link. To get things started, let’s take a look at the deck that took down the last open as played by Sander. We could take the deck played by Cedric in the quarter final or the version played by Peter at the invitational just the same. These decks are in essence Blue Black midrange value decks centered around removal, creatures with come into play effects that can be re-used by “blink” effects, card draw and solid mythics/rares. While a lot people will point at The Scarab God rotating out, the thing that really makes these decks work is a good early defensive plan combined with the card draw and removal to make it to the late game, at which point any bomb can take over but The Scarab God has been exceptionally good and resilient at doing this. It’s in the early game we see some issues when taking a look at the cards spoiled from Guilds of Ravnica. As of yet, there doesn’t seem to be a good replacements for Gifted Aetherborn or Fatal Push (most likely because an early defensive card similar to the aetherborn is going to be found in the white black guild called Orzhov, which will be featured in the set after Guilds of Ravnica). 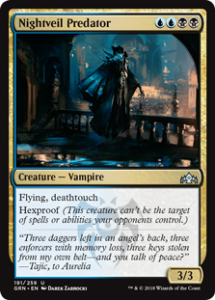 On the plus side, the BlueBlack guild, Dimir, has goodies that will fit in this style of deck and one of the most notable cards in that regard is this nigh impossible to kill flyer Nightveil predator. The choice of rares/mythics, and the respective splash, is a matter of choice and/availability. This build features Nicol Bolas, the Ravager but Teferi, Hero of Dominaria can be just as solid, just take rares/mythics with a HIGH impact on the game. Because of Nightveil Predator we would advise against going too deep on the splash though. If you would like to go deeper to have more answers, the next flavour of deck might be more to your liking. As a last note on UB midrange: it might be possible that it’s a good idea to move away from the blinking and value train of the current style of UB midrange gentry decks and try to build around surveil. A deck that often get’s lumped in together with the BlueBlack midrange deck, but plays very differently, is the deck as played by Emiel or the one with red splash as played by Joris, both of which made it to the top 8 at the last open. The differences should be clear when you take a look at the decklist. BlueWhite control decks play less creatures, play more removal/counters and play mass removal as 1 or 2 of their rares. As Blue White control received lots of support over the last couple of sets, expect these decks to stay around. Sure, they lose Fumigate as board wipe and Approach of the Second Sun as win condition but core set 19 already offered an alternative to Fumigate in Cleansing Nova. Really strong win conditions at rare/mythic are always a thing in any given set. A good point to start is having a look at the in-color Planeswalkers. The challenge for BlueWhite control might be that a lot of the cards for control will be either in Dimir (blue black) or Izzet (blue red) for now, so most likely these decks will evolve more towards a build as played by Joris (Jeskai – Blue White red) or maybe Esper control (blue black white). This might change when the next set comes out and the BlueWhite guild, Azorius, gets to play center stage. If you fancy this style of deck, take either version from the open to start with and swap out the rotating cards for new, similar versions. As an example, in joris’ build you can swap out Magma Spray for Shock or Shivan Fire and Glimmer of Genius can be replaced by Chemister’s Insight. 3 of the 4 rares should probably be Settle the Wreckage, Cleansing Nova and Teferi, Hero of Dominaria unless the metagame changes drastically. 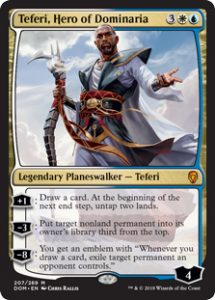 The 4th slot is most like another high impact Planeswalker like Karn, Scion of Urza, Tezzeret, Artifice Master or perhaps the Ral, Izzet Viceroy depending on preference and what you have available to you. Oddly enough a deck that is seeing very little play, yet in Bredene Kristof has been doing quite well with reliable 3-1 showings that he followed up with in a nice top 8 at the last open. If you like Dinos, this might be time to get them to come out and play. Very little needs to be said about a deck that barely loses any cards save cycle lands and a bomb rare. 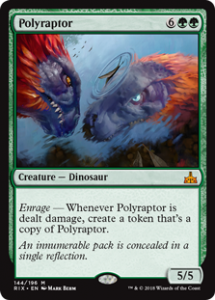 You can easily replace Rhonas, the Indomitable with a high end dino like Ghalta, Primal Hunger, or go funky with Polyraptor, or splash for Gishath, Sun’s Avatar or Zacama, Primal Calamity. The rest is twiddling with the numbers and replacing some removal cards. Another option if you want to stay mono red can be found by going back to before the release of Dominaria and pick a deck that was having some succes at that time: mono red pirates. As your goal with this deck is to combine a boost effect like Run Amok with Buccaneer’s Bravado it’s less suited to run Flame of Keld, but if you want to run flame by all means do so. 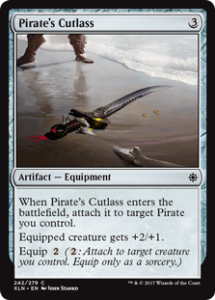 Some of the key pirates (Daring Buccaneer, Rigging Runner, ..) are uncommon which means less room for creative card choices. Still, this deck will suffer from the loss of Anh-Crop Crasher, although it can be replaced by burn spells like Lightning Blast. If you are expecting some go wide decks in your meta, keep the Fiery Cannonades in the side, if not they probably could be replaced by something like Lightning-Rig Crew. 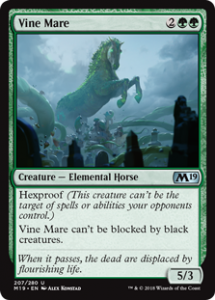 Although the energy build that was played at the open will lose all the creatures with energy, they can easily be replaced by some of the green goodies that we got in Dominaria and core 19. Guilds of Ravnica also has some new toys. The plan to “put enchantments that give flying on the hexproof creatures” is still fine as you have one with the wind and arcane flight. Of course Flight doesn’t come with a card draw stapled onto it like the blue cartouche so we made room to include curious obsession to compensate. 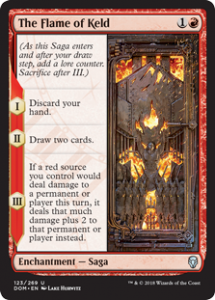 The thing though, which ties in with the token deck played by Joris at the invitational, one of the 5 featured guilds in Ravnica is the WG guild Selesnya and the spoiler has shown us lot’s of interesting (convoke) stuff. A WG build can make room for the Satyr Enchanter from core set 19 and together with some nice enchantments can provide the player some value…(and well,… flying lifelink horses :p). 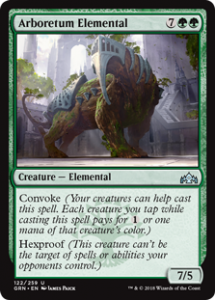 Although similar to the UB midrange deck, what makes this type of deck different is the use of green for ramping and mana fix. Another strength of this deck is playing mostly creatures and where possible ones with good come in to play ability. The advantages lies in dodging conditional hate cards like Negate and Duress AND that you have the ability to re-use/reanimate your creatures from the graveyard. How about this build as a starting point? Although Jelle opted to include some funkiness in his invitational build, making it not a “true” knight deck anymore, very little of his deck will rotates as the theme is mostly rooted in Dominaria, with a nice addition from core set 19 in Militia Bugler. The rares might be up for debate but as mentioned before, rares in Gentry often also come down to personal preference and/or availabity. Isareth, the Awakener might be a passable replacement for Liliana, Death’s Majesty although more fragile as she is a creature, and Gonti, Lord of Luxury was always mostly a card Jelle just likes a lot but that can be easily replaced with History of Benalia, Aryel, Knight of Windgrace or Lyra Dawnbringer. 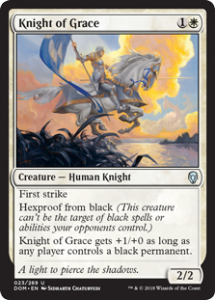 One of the stand out parts of the deck is that lots of people play black removal and Knight of Grace can laugh in the face of a chuppa all day long and live to tell the tale. If you like any of the above decklists, make it your OWN and play with the stuff YOU like and want to include. It’s higHly likely we will be seeing these decks in some form or another the first weeks after rotation so it’s good to be a bit prepared, but nothing is set in stone and there are obviously still lot’s and lot’s of other options! Gentry has always been and always will be a place where people can tinker with cards and decks and explore interactions that are harder to pull off in “normal“ standard. Be on the lookout for mind warping cards in Guild of Ravnica and possible interactions with cards from the previous sets. Until then, have fun at the prereleases the weekend of september 27th till september 30th and open cards you want to build decks with! Tom is a family man with 3 kids and an amazing wife that fell in love with constructed again thanks to Gentry. He has been playing magic since Visions (1997) and in his grinding days qualified and went to the Pro Tour 4 times (Los Angeles , Nice, Kuala Lumpur and Kyoto), he also was a Grand Prix regular and managed to make day 2 at Gp’s a dozen times back int he day you needed to win 7 rounds on day one to advance.